To play somewhat on the title of the masterpiece by British bard John Milton, I shall attempt in the following article to show how sailing, and its related water-borne activities, can greatly contribute to protecting and saving the environment and also help to promote a healthier and better lifestyle. According to authors Beard and McKie, in their riotously funny book A Dictionary for landlubbers, “Sailing is the fine art of getting wet, and becoming ill while going nowhere at great expense.” While admittedly, sailing is not for everyone – for only a few, in fact – there are some most positive aspects, which I shall try to emphasize here. His Majesty the King of Thailand has been a driving force in the development of sailing in the kingdom. Sailing is both environmentally-friendly and economically sound. Many years ago, when I first entered this delightful country, I wrote an article, entitled “Sailing: a panacea for tourism.” Now, a decade or two down the line, the environment is under constant siege and the ‘fixes’ have reached a greater urgency and are much more expensive to implement, but not impossible, and sailing can help. 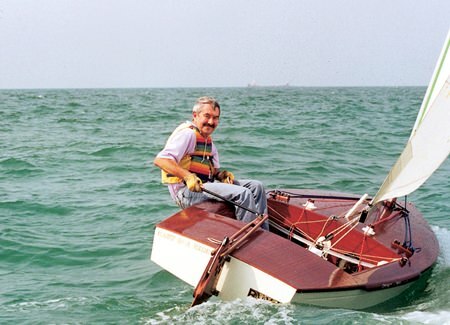 An old sea dog takes his OK dinghy for a spin around the bay. Much as I disdain power boats, jet skis and other mechanical forms of marine activities, these contraptions do, no doubt, contribute much to the tourism sector. Tourism, because of the political problems in the kingdom, is coming under increasing pressure, but the marine sector is still flourishing and is continuing to draw hard currency into the nation’s coffers. A fully-fledged sailing boat is somewhat akin to a floating billboard and regattas are therefore a magnet for both local and international sponsors who wish to have a craft’s sides and sails festooned with their company’s own name and logo. The sailors themselves also do their bit and just last month at the Ocean Marina Yacht Club in Jomtien, a huge regatta featuring some 250 boats took place and 1,000 sailors from all corners of the globe added millions of baht to the Thai economy. The solar-powered “Heliotrope” provides a new, environmentally conscious blueprint for boat builders worldwide. 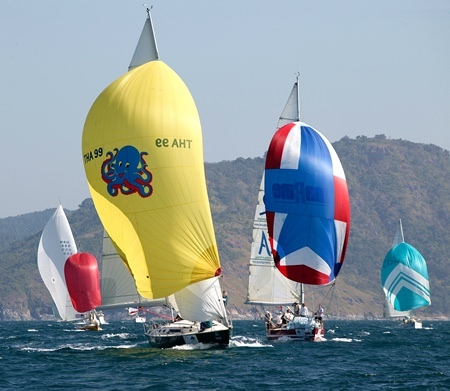 Regattas are held annually up and down the coastlines of the kingdom, from Phuket to Pattaya, and the recently concluded Koh Samui Ragatta contributed greatly to “full house” signs going up around the island, with regatta organizers having to scramble to find accommodation for all those involved in the event. The welfare of less-advantaged citizens, especially youngsters, can also benefit from the sport of sailing. An example of this is the annual “Pattaya Mail PC Classic” yacht race held off the Royal Varuna Yacht Club in south Pattaya. For the past two decades this race has been sponsored at various times by the Royal Cliff Hotels Group, Jomtien Pattaya Rotary Club and numerous hotelier groups and businesses from the private sector. This event alone has raised millions of baht for many charities around the region, and especially to help the two groups at the opposite ends of society – the young and the aged. Thailand is producing more and more champion junior sailors in the worldwide Optimist series. On the subject of the environment, a classic case of sailing doing its ‘bit’ is the award-winning Cape Panwa Hotel Phuket Raceweek, held in July each year, which promotes a clean and green event. The Clean Regattas program is a global certification system that encourages regatta organisers and yacht clubs to manage and run environmentally-responsible events. Its main initiative is to reduce marine debris and preserve coastal land and waters. Buoyed up (to use a nautical term) by these environmental-protection measures, which add so much to the joy of sailing and guarantee its continuation, thousands of yachting aficionados from the temperate and cold northern climes of Europe, North America and elsewhere are lured here by tales of Sailing in Paradise, carried back first-hand by those who have participated in events here. Owning a yacht is always regarded as the prerogative of the wealthy – a “rich man’s sport” so to speak, and it certainly is that. Compared to the usual paraphernalia required to participate in active sports, a yacht is an extremely heavy investment and beyond the means of most ordinary folk. But, there are ways of joining the fray. Opportunities abound to crew on someone else’s boat and enjoy all the action, fun and adventure without the expense. To be out on the sea, matching your wits with Mother Nature’s forces of wind, climate and tide and enjoying the fresh air, the tang of the sea, and the huge dome of the heavens above is rather hard to beat – even as a crew member! Curiously, when the sport of sailing was in its infancy many years ago, a well-to-do Thai’s idea of a day on the sea might have been to drive his or her limousine down to an air-conditioned launch, do a few circuits of the bay and then reverse the journey. A “hard day at the sea” he or she would recount to colleagues ashore of the weekend’s activities. Sailing offers great fun and the chance to reconnect with the natural environment. Perhaps this ideal of a day on the briny still goes on, but nowadays Thais are excelling on the world yachting stage, from local events right up to Olympic standards, and the nation is producing some top-class sailors. 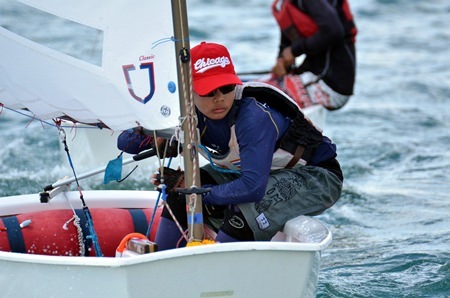 Much of the new popularity of sailing is nurtured in the junior (under-16) ranks, where Thai and ex-pat children compete frequently – and successfully – in the worldwide Optimist dinghy series. Thailand has improved so much that the kingdom’s teams have gone on to become world champions on several occasions. The main problem for Thai youngsters who compete overseas is that the waters elsewhere are invariably colder than at home, and there is also no khao-pad readily available! 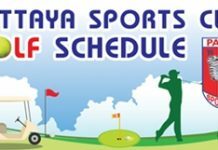 There are numerous sailing groups up and down the kingdom that cater specifically for children; the Royal Varuna Yacht Club in Pattaya, the Royal Thai Navy at Sattahip, Ocean Marina Yacht Club in Jomtien, while both Koh Samui and Phuket conduct vigorous training and racing programs for juniors. A racing fleet under full sail in the waters off Phuket. At this year’s Top of the Gulf Regatta at Ocean Marina Yacht Club, some 150 boys and girls from all over Thailand competed in the Optimist National Championships. Some of these sailors were as young as seven years old yet all thrived in the fickle weather conditions. These youngsters know that a few hours sailing in the fresh air, the beauty of the environment and the challenge to their young minds certainly beats hours in a noisy, cluttered shopping mall, competing with television fare and brain-numbing game machines. Of course, there are horrendous stories of sea-borne disasters (Titanic, anyone?) Nevertheless, facing the challenge of the sea, despite being fraught with peril, is inherent in our nature. The sea is a hard master, but putting aside the usual Hollywood glorification of survival in films such as Robert Radford’s “All is lost;” and Tom Hanks in “Castaway”, there have also been real life heroic epics of adventure, such as the ongoing single-handed trans-oceanic races. Over the last two years, in fact, two teenaged girls have sailed single-handedly around the world. First Dutch girl Laura Dekker, and then an Australian girl Jessica Watson, both displayed incredible stamina and adaptability as they faced some 250+ days at sea – all alone! Feats like these represent the triumph of the human spirit as the two girls took on stupendous odds, fighting for survival in the treacherous Southern Ocean with winds raging at 80-knots and sea swells as high as city skyscrapers. There are also any number of family groups who regularly take to the seas, sailing around the globe to educate their children, both onboard and at visiting ports. One such marine “globe-trotter” and his family made landfall at Phuket some years ago. The captain was cajoled, urged and likewise press-ganged into joining the ongoing regatta. He unloaded all excess materials to make his craft race-ready; this included a live-aboard resident pet dog, which was deposited into the anchored dinghy. After the race, he returned, but no dog! Both he and the family were heart-broken. At the prize-giving, our sailor went up to receive his second place prize which, along with the usual silverware, included a huge box. And out jumped his beloved dog! One of the competitors had seen a dog swimming alone in the Andaman Sea, picked it up and brought it ashore. Speaking of single-handed sailing, as we all know, the King of Thailand, an avid sailor, boat-builder and competitor has set a number of sailing records. I have had the extremely good fortune of having sailed with His Majesty out of the Klai Kangwon Palace, where the King keeps a flotilla of sailing dinghies. First through the Bangkok Post and then through successive issues of the Pattaya Mail I have written a number of first-person narratives of these treasured encounters. 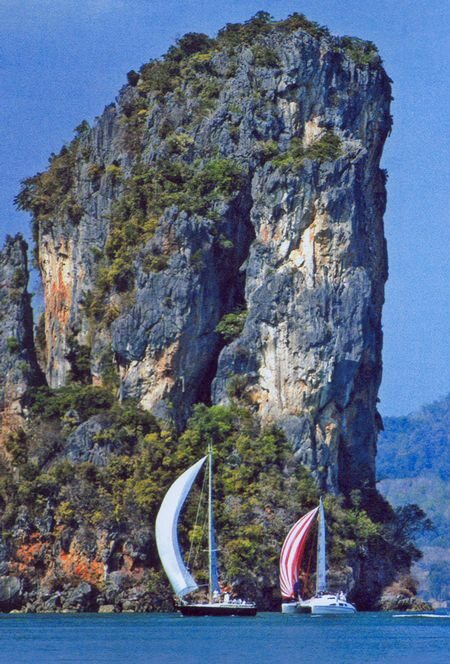 The King’s love of the sea and sailing has been legendary and is inherent in the development of the folklore of sailing in Thailand. 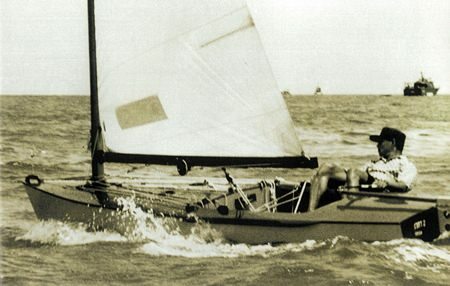 For example, on 19 April, 1966, the King sailed the OK dinghy he had built himself across the Gulf, from the Klai Kangwon Palace in Hua Hin to the Royal Thai Navy base at Sattahip. This distance of 60 nautical miles required tremendous stamina and determination for some 16 hours of concentrated helming. At the time it was mooted as the longest single-handed dinghy crossing, out of sight of land, in the world. On another occasion, on 16 December, 1967, His Majesty was awarded a Gold Medal by Queen Siirikit, as the winning helmsman (OK dinghy) in the then South East Asian Peninsular Games (now the SEA Games). Actually, sailing history was created when the King’s daughter, HRH Princess Ubolratana, came in equal first. This day has since been celebrated as Thailand’s National Sports Day. Besides having his own yacht club at the Klai Kangwon Palace, the King is also Royal Patron of the Royal Varuna Yacht Club, the centre of most of Thailand’s sailing activities. With full support from the Royal Thai Navy and the Yacht Racing Association of Thailand, Royal Varuna has hosted innumerable world, national and local championships in its 60-year history. 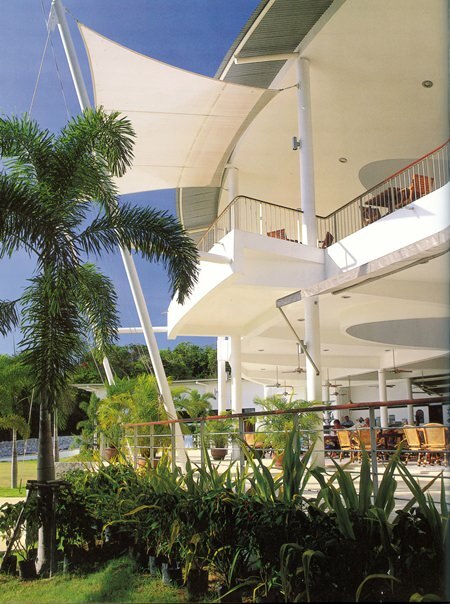 In the early days of sailing, the King and Queen, together with members of the Royal family, frequented the then Varuna Marine Club, located on a pristine beach in south Pattaya, now unrecognizable as a sea-front restaurant. Many times the Royal family entertained visiting dignitaries at the old Varuna Marine Club. On one particular weekend, in March, 1965, there was a gathering of Sweden’s Royal Family, the UK Royal Consort, Prince Phillip, Prince Bhisadrj Rajani, the incomparable Prince Birabongse Banubandh and the Portuguese Ambassador. Of course a race around Koh Larn eventuated and The King won, but, for matters of protocol, Prince Phillip’s placing was not mentioned! His Majesty has always looked on sailing as a marvelous escape from his Royal duties, while nurturing both the environment and a healthy lifestyle. The growing popularity of sailing has seen the inevitable build-up and development of related marine infrastructure around the kingdom. 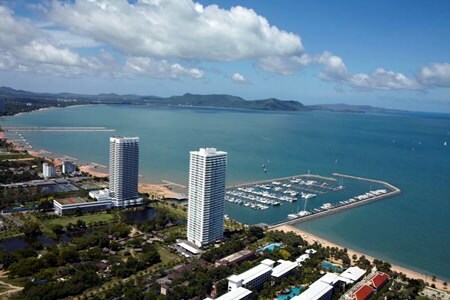 Marinas, boat yards and chandleries have evolved around all the main venues: Phuket, Koh Samui, Hua Hin and, as noted before, the Ocean Marina at Jomtien. Ocean Marina Yacht Club in Jomtien offers one of the finest sailing facilities in Southest Asia. Boat-building in the kingdom has also seen an exponential development. The world’s largest production yacht, the Mirabella, was designed, built and launched from the Ocean Marina Yacht Club in September, 1991. And earlier this year the same venue saw the launch of the world’s first “solar-powered catamaran” the Heliotrope – a craft eventually capable of trans-navigating the world by solar power. The environment wins big around here as the rich boys with their rich toys can help Mother Nature along the way. 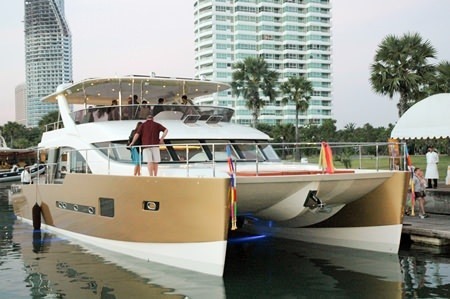 NB: For more information about sailing opportunities in Pattaya, go to website: http://varuna.org or www.oceanmarinayachtclub.com. The Royal Varuna Yacht Club in Pattaya.